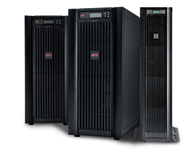 APC offers a range of UPS systems that will cover everything from small computer backup to the proection of high availability facilities. Critical Power Systems welcomes the opportunity to review your application and provide a solution that will protect your critical equipment. Below are some of the APC UPS products. For more detail or additional products, please contact us. many years. It ranges from under the desk back up power strips for personal computers and peripherals, to the large three-phase UPS systems available in the Symmetra and MGE Galaxy lines. The APC Symmetra PX line is a world class, redundant, scalable, power protection system designed to cost effectively provide high levels of availability. Seamlessly integrating into today's state-of-the-art data centre designs, the Symmetra PX is a modular system. It consists of dedicated and redundant modules--power, intelligence, battery, and bypass. The design is easily and efficiently serviceable, and this architecture can scale power and runtime as demand grows or as higher levels of availability are required. Symmetra PX serves as the core power train that drives APC InfraStruXure® systems for small and medium data centres. It can also power individual “zones” of larger data centres. Highly manageable, the Symmetra PX features self-diagnostic capabilities and standardized modules which mitigate the risk of human error resulting in increased overall data centre reliability. 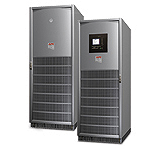 The Symmetra MW redefines high-power UPS technology as a modular, fault-tolerant UPS in the 400-1600 kW range. Ideal for large data centres, complete buildings, healthcare, and other critical facility protection requirements, the Symmetra MW can be scaled for rigorous and changing electrical demands. Symmetra MW provides increased availability through internal N+1 configurability, predictive failure notification, and multi-module paralleling features. Symmetra MW delivers best-in-class efficiency and a reducing in rating of electrical infrastructure—wires, transformers, and generators. Slide-in/out power modules, manageable external batteries and self-diagnosing features greatly reduce mean time to repair. Combined with a wide range of line-up and match options, Symmetra MW provides a customizable system in a standardized design for any large on-demand network-critical physical infrastructure. The Smart-UPS® VT line (10/15/20/30 kVA—three-phase) offers centralized three-phase power protection with the reliability of the award winning Smart-UPS family. Ideal for small data centres, large retail stores, regional offices, and dense power requirements, the Smart-UPS VT includes dual-mains input, automatic and maintenance bypasses, and scalable runtime with hot-swappable batteries for increased availability. The rack mounted version maximizes valuable floor space by incorporating UPS, power distribution, and additional battery capacity in a single rack. Low cost of ownership is achieved through best-in-class efficiency and a reduction in rating of electrical infrastructure—wires, transformers, and generators—owing to the Smart-UPS VT’s Soft Start feature. The APC Network Management Card with temperature monitoring provides remote monitoring and management through a simple web/SNMP interface and provides integration with APC’s InfraStruXure® Manager. Serviceability is greatly enhanced by user-replaceable batteries, manageable extended run frames, and start-up and standard onsite warranty services. All these features make the Smart-UPS VT the easiest UPS in its class to deploy, manage, and maintain. The MGE Galaxy and EPS lines represent further options for mission critical UPS. The larger units—Galaxy EPS 6000, 7000, and 8000—are designed for enterprise data centres, industrial plants, and communications facilities needing robust three-phase power protection with adaptability to meet the unique requirements of large mission critical environments. Galaxy 3500, 4000, 5000, and PW units cover the spectrum from 10 to 225 kVA and are best suited to medium-sized data centres, and other industrial and facilities applications.